It's 95-degrees in Los Angeles, but it's autumn in our hearts. In fact, the appearance of maple-infused cocktails and squash-based dishes on menus are the only reasons we're certain it's actually November. It makes perfect sense. Until the modern era of refrigeration and factory-farming, seasonally-based cooking was the norm across cultures and for centuries. We know. Yet, the constant autumnal presence of squash often feels like a knee-jerk insistence on cramming Thanksgiving down our throats -- metaphorically and literally. 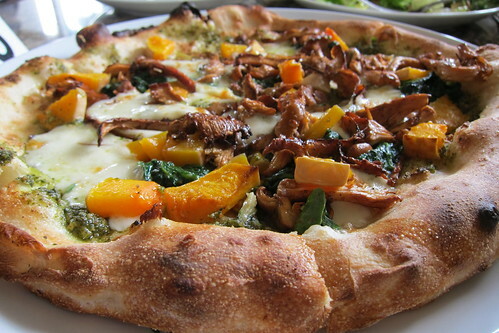 Setting aside what is clearly an unfair skepticism toward squash, we were pleased to discover the squash and chanterelles pizza at recently opened Olio Pizzeria & Cafe. The squash is no afterthought, no mere prop to fortify an autumnal theme. It's integral to the pizza -- and it's delicious. Sweet and roasted, the squash is, unsurprisingly, brought to life by the garlicky basil pesto. 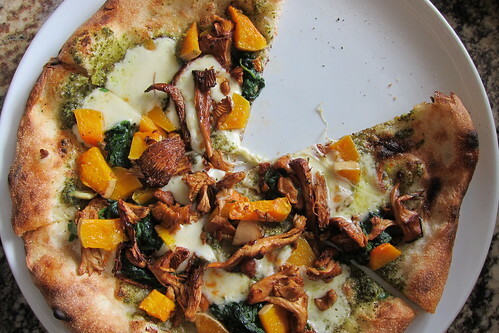 What's surprising is how well the squash pairs with chanterelle and oyster mushrooms. There's also a bit of spinach in the mix, though it adds more color than flavor. Crust is to a pizza what a drummer is to a rock band: the base onto which all other tonal elements are layered. Olio's crust isn't the wafer-thin variety idolized in New York or the deep-dish crust favored in Chicago. This is a Neapolitan pizza with a bubbly, chewy crust halfway between the two. Baked in Olio's 800-degree oven (presumably not with illicit coffin wood), it's light and crisp with blackened bubbles occasionally dotting the rim. The other top-tier pizzerias in greater L.A. -- Angelini, Bollini's, Mozza -- might have a little competition on their hands.